Posted December 21, 2016 by Seán Kinane & filed under Environment, News and Public Affairs, Water. Four environmental groups have put the U.S. Army Corps of Engineers on notice that they’ll sue if the Corps follows through with authorizing phosphate mining on more than 50,000 acres of land in Central Florida. The environmentalists say the strip mining damages wildlife habitat and endangers drinking water and they’re threatening to sue the U.S. Fish and Wildlife Service as well. WMNF News interviewed Jaclyn Lopez, Florida director of the Center for Biological Diversity, one of the four groups who filed the intent to sue on Tuesday. “The Army Corps of Engineers has recently approved the phosphate mining development of about 50,000 acres of central Florida and this is predominately in Hardee, Manatee County areas and a little bit in DeSoto County. Most recently, they approved 7,500 acres of mining to start eminently, any moment now, in Hardee County. 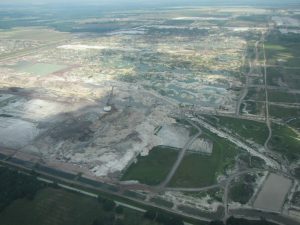 Phosphate mining in Florida. By Jaclyn Lopez (used with permission). “All this mining is going to be taking place in a region known as Central Florida Phosphate District. It’s an area that has seen tremendous phosphate mining over almost the last century. If you go out to that area, which is just east of Tampa, you’ll see the scars from historic phosphate mining. “Before 1975, phosphate mines didn’t have to be reclaimed. If you’re ever in an airplane over that region of Florida, you’ll see these, sort of really pretty colored bluish-green bodies of water, like lakes, in these strips. 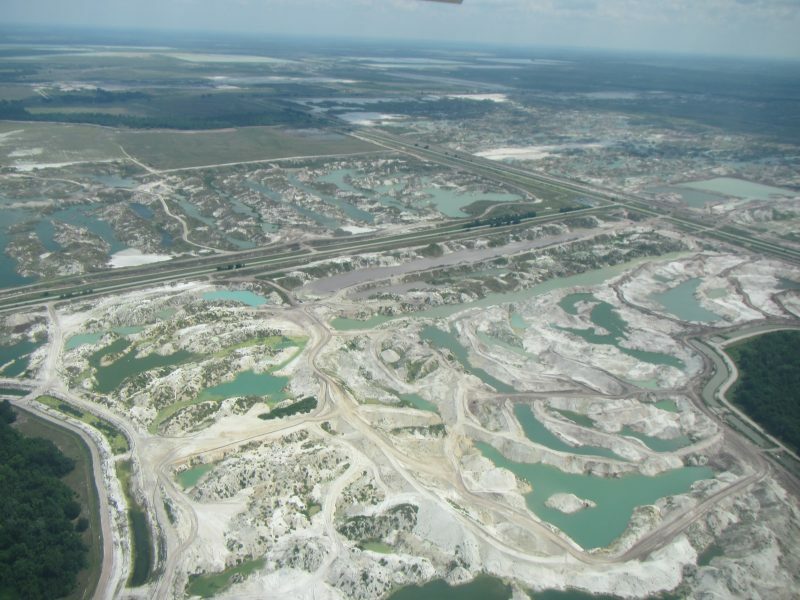 That’s the legacy of strip-mining in Florida for phosphate. Since 1975, the companies have been forced to reclaim the land, which is to put it back to some sort of beneficial use, but, not necessarily to restore it. “Our concern with this 50,000 acres of additional mining is first, it leaves a huge footprint on Florida. You’re removing 50,000 acres of habitat for imperiled species like, the eastern indigo snake and the crested caracara. Also, you’re adding to our existing phosphogypsum problem.